This ministry provide summer fun for our children in the form of planned and meaningful activities. We minister to children age 6 - 17 years of age. Various outdoor activities occur daily and we emphasize a hands-on approach with our children. Come! Join Summer Day Camp here at TLFC, where the love of God is contagious! Reader’s Theater * Mime/Praise Dancing * Drill Team, and much, much more! There is no provision for campers that do not attend trips. Application Fee: $5.00 non-refundable application fee required for each camper. 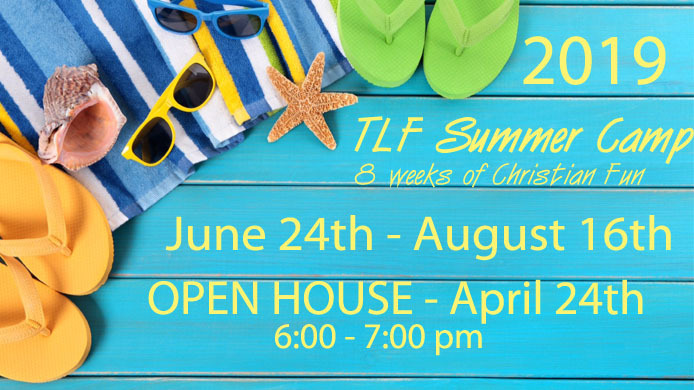 Registered TLF campers receive a 50% discount!! Complete the following three steps to enroll your child in True Light Fellowship Summer Camp. WE LOOK FORWARD TO SERVING YOU AND YOUR CHILDREN THIS SUMMER! If you would like to be on our mailing list please complete the contact form. We will send you some literature about our programs.